(Newser) – US Ambassador Nikki Haley said Wednesday that North Korea's launch of an intercontinental ballistic missile that some observers believe could reach Washington and the entire US Eastern Seaboard "brings us closer" to a war the US doesn't seek, the AP reports. Haley, speaking at an emergency meeting of the United Nations Security Council, said that if war comes as a result of further acts of "aggression" like Tuesday's launch, "make no mistake the North Korean regime will be utterly destroyed." 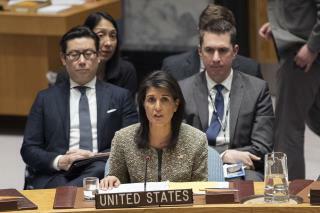 "The dictator of North Korea made a decision yesterday that brings us closer to war, not farther from it," Haley said. "We have never sought war with North Korea and still today we do not seek it." The Trump administration threatened new sanctions on North Korea after the reclusive government shattered 2½ months of relative quiet with its most powerful weapon test yet. President Trump tweeted that he spoke with Chinese President Xi Jinping about Pyongyang's "provocative actions," and he vowed that "additional major sanctions will be imposed on North Korea today. This situation will be handled!" Trump's top diplomat, Rex Tillerson, said the US could target financial institutions doing business with the North. The fresh deliberations about new forms of punishment for North Korea came after its government said it successfully fired a "significantly more" powerful, nuclear-capable ICBM it called the Hwasong-15. Outside governments and analysts concurred the North had made a jump in missile capability. So we will murder all the women & children just to remove him & his loons... Than truly we are no superpower. Are they going to Nuke NK, or invade and occupy? China wont let either one fly.